Pomfret is one of my favorite in seafood. 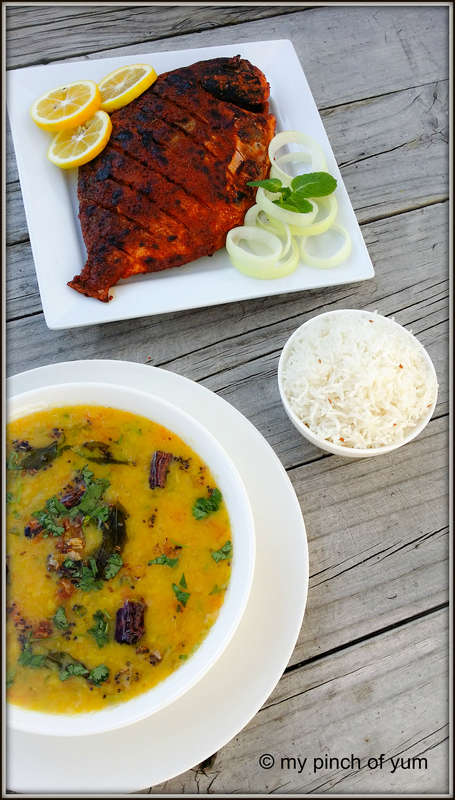 And, if you are a fish lover, then this is the dish you should definitely give a try. Traditionally, any variety of Tandoori is made in a tandoor oven or clay oven. But since i don’t have a traditional tandoor, i have just grilled my pomfret. Clean the fish and make few deep incisions on both sides of the fish. Combine ginger garlic paste, 1/2 tbsp chili powder, turmeric, lemon juice and salt, in a bowl. Add the fish and rub in the marinade on both sides, making sure the fish is completely marinated. Meanwhile, take the rest of the ingredients in a bowl and whisk well. Rub the fish with the marinade to coat properly. Also try to fill some marination inside the fish. Cover and set aside the marinated fish in the refrigerator for 4-6 hours or overnight. Cook the fish for 6-8 mins each side, on the griller, basting with some oil in between. Serve hot with some onion rings, lemon wedges and a mint chutney. I really honestly think that ppl who share recipes are big hearted ppl.. They are devoid of the being calculative trait.. If my dear ones and people in general had not shared their recipes, i would have never been here & also might not have got to see a smile on my loved ones face every day, coz of me. Hats off to all the bloggers out here who are sharing their experiences and knowledge with the world. I get to learn soo much each day. Cheers to you. That has to be my favorite type of fish too, it looks super yummy! Wow that looks really impressive! It looks Yum. Is the Pomfret a Silver Pomfret. 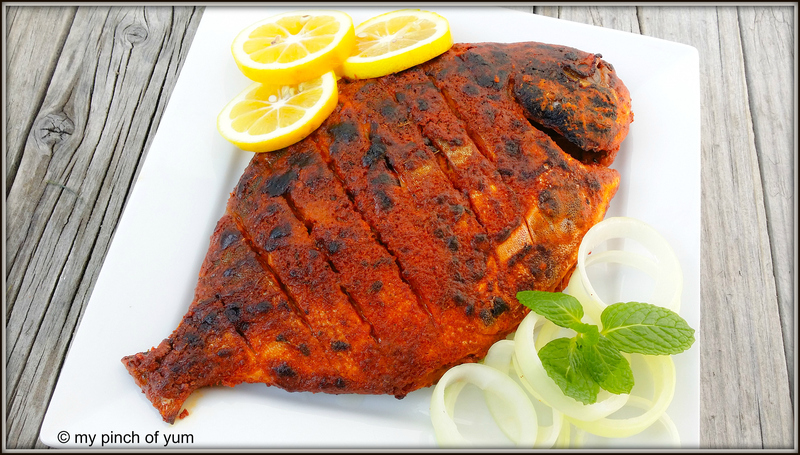 Will the same recipe work with Black Pomfret or a Chinese Pomfret? Thank you sunaina. Yes it’s indian silver pomfret. And yeah you can use any fish here, but remember any small fish (kaane-silver whiting, mackerel etc ) will cook soon so grill for less time. My mil uses black pomfret sometimes too. 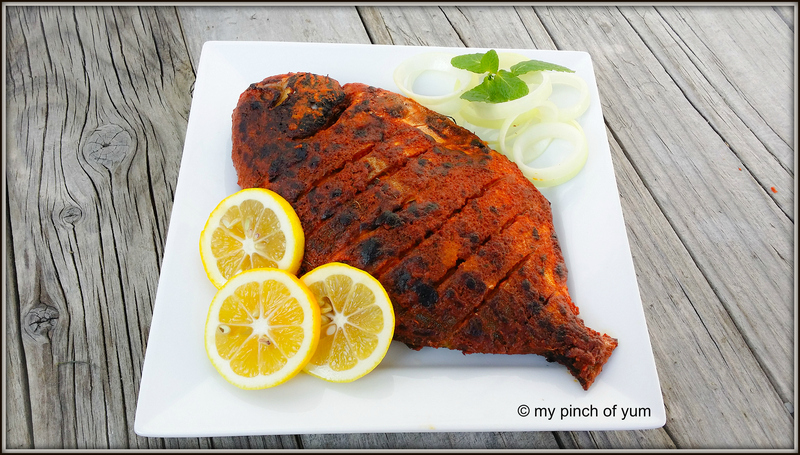 Whole fish tandoori style! It looks delicious and so pretty plated, as well.